"I use the Inspire 2 to fly inventory for my company and I have had to call Matthew Stevens [at GeoCue] on several occasions while in the field and also on processing. Customer service has always been top notch and he has always been extremely patient and understanding and is always very helpful." LIDAR mapping has revolutionized the way we capture elevation data and map 3D features. By mounting a laser scanner on an airplane, helicopter, UAV or vehicle, fast, accurate, high-resolution point clouds can be captured. 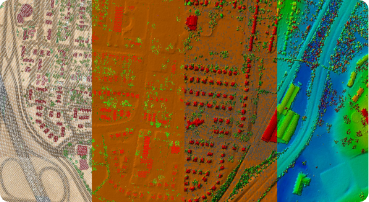 Having the tools and expertise to work with LIDAR mapping data effectively is critical to realizing the value of data sets. Imagine the value of having 3D data for site planning with data only a day old. Drone mapping along with processing software provide the capability to do ad hoc site mapping — enabling a fundamental change in how stockpile volumetric computations are performed. GeoCue Group provides a range of solutions for managing geospatial data, particularly for storage, searching and distribution of LIDAR and imagery. Whether your need is local data management for a small production shop or state-wide LIDAR distribution, GeoCue Group has a solution to fit your requirements. Whatever your geospatial need, we have top of the line products that will help you work more accurately, easily and efficiently. Over the years we’ve worked with the geospatial industry’s leading companies to deploy and build scalable workflow solutions on a solid foundation of best practices, earning their trust as a true extension of their team. We’re proud of our track record and aim to keep it that way.